Google was handed a clear defeat on Monday when Chinese search engine Baidu announced they would pre-install many of its popular search services on next-generation mobile phones. The mobile phone market is targeted by Google as the next frontier on the web. From the launch of their advertising platform designed specifically for mobile phones, to the creation of Android (the mobile phone operating system), Google is clearly intent on dominating the mobile market. Even worse for Google is the fact that China Unicom offered said it would begin taking preorders for the iPhone on Oct. 1, when it launches its commercial 3G service. China Unicom plans to offer five versions of Apple’s iPhone through an array of two-year service plans. And now, all of these iPhones are apparently coming pre-installed with Baidu – not Google. However, the one unknown factor is whether or not the mobile phone users in China will instantly switch their services over to Google. 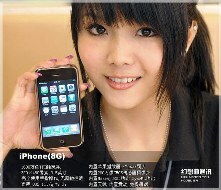 In fact, the iPhones may even be locked so that Baidu services cannot be switched. China’s people are known for taking matters into their own hands through the black market. Just because the government won’t let iPhones be sold officially, there is a booming black market for iPhones in China. Regarless, Google faces many challenges in the China mobile phone market and definitely has their work cut out for them in gaining the dominant market share of the mobile web market.